The Drawing Room offers a wide variety of artistic opportunities for artists ages four to adult for nine weeks. Join us at the studio for daytime camp experiences, afternoon and evening classes, portfolio development and private lessons. It will be a summer filled with fun, creativity, learning new art skills, creating great artwork, making new friends, and building confidence. This 1 hour class provides a unique opportunity for parents/caretakers to help guide their children through a creative and fun art project. Parent and child work together as children experiment with new materials, learn about color, texture, and more. We provide a wide variety of materials for our young artists to explore. 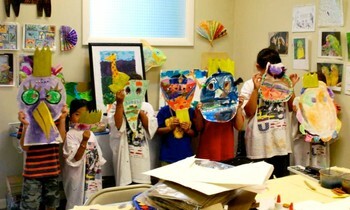 Help nurture your child’s creativity this summer! Have fun while learning how to expand your creativity through different theme based projects while working with great art materials. Students will express themselves through a wide variety of mediums as they explore drawing, painting, sculpture, and collage. Every Wednesday students will draw and paint outside at the designated outdoor locations. On occasion, we infuse music into the workshop when we are joined by flutist Carla Auld. *Please drop off and pick up at the designated outdoor location. *All parents must fill out a medical release form for each child to attend the Outdoor Workshop. $215 per week ... $50 per class. We encourage each student to be creative and think outside the box. Students will experience multimedia theme based projects. They will be introduced to color theory, composition, shading, drawing techniques, and learn how to use media such as pencil, pastel, watercolor, acrylic paint, clay, wire, paper mache, and collage. Students have the opportunity to work at their own pace and skill level. We help them develop their ideas into completed pieces. Drawing and sketching techniques will be introduced in pencil, colored pencil, charcoal, oil pastels, and soft pastels. Projects will vary in medium, subject, size, and style. Our artists will learn painting techniques in watercolor, tempera and acrylic paints. Still-life, portrait, and landscape projects will be introduced in both representation and abstract styles. This is an intrdocution to the art of cutting and pasting as well as assembling items to create realistic and abstract masterpieces. A variety of styles, materials, and techniques will be introduced and explored. There will be opportunities to experiment with three dimensional design in a variety of materials. Clay, wire, and paper mache sculpting techniques will be introduced and the artists will use their imaginations to guide them in making their three-dimensional creations. This session will introduce students to both contemporary and traditional mosaic artwork. Students will translate their ideas into mosaic masterpieces using a wide variety of mosaic materials including tile, glass, shells, and more. Mosaics will be created on flat as well as three-dimensional surfaces. 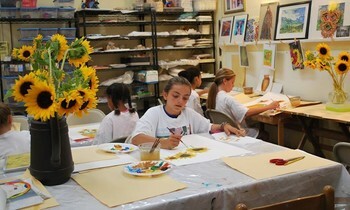 Our full day program combines The Art Experience and our afternoon Specialized Fine Arts Camps. Our staff will supervise our full day campers as they have lunch at one of our local eateries or enjoy their packed lunch from home. They will have time to relax and play in one of the two parks located in our neighborhood. 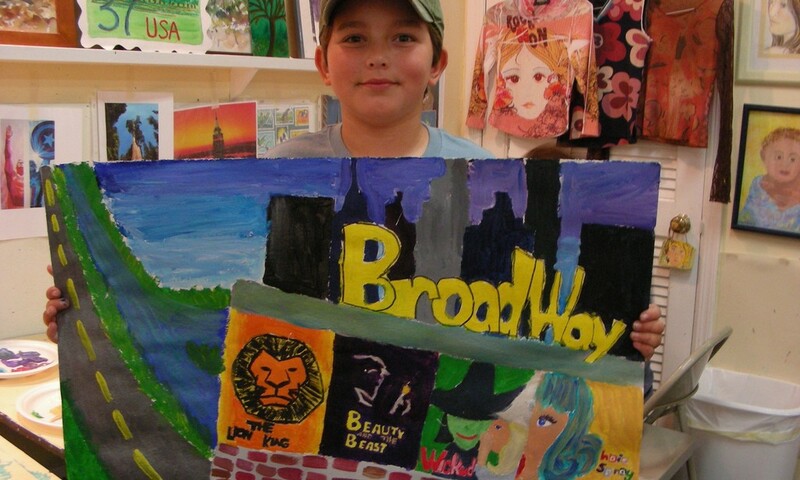 This exceptional art experience will introduce your child to a wide variety of art techniques while they have fun and meet new friends. Every Wednesday students will draw and paint outside at designated outdoor locations. On occasion, we infuse music into the workshop when we are joined by flutist Carla Auld. *Please drop off Full Day student at designated location at 9:30am and pick up at the Studio at 3:00pm. We will provide transportation for your child back to the studio at 11:30am for lunch. *All parents must fill out a medical release form for each child to attend the Outdoor Workshop. Please drop off form the first day of camp. *Drop off and pick up at the designated outdoor location and please send a snack and drink with your child. *All parents must fill out a medical release form for each child to attend the Outdoor Workshop. Please drop form off the first day of camp. Drawing and painting outside on location is a wonderful way to learn perspective, understand depth, see light and color in its natural form. Students will explore the grounds and captures its beauty in their artwork. On occasion, we infuse music into the workshop when we are joined by flutist Carla Auld. Medical Release forms must be signed prior to the workshop. Students should wear sunscreen and bug spray, bring a water bottle and snack, dress appropriately for warm temperatures and outside conditions. Students will be transported to a local business for restroom facilities if needed. Students will create an assortment of exciting projects while working in all mediums such as pencil, pastels, watercolor and acrylic paints, collage, paper mache, wire, clay, and assemblage. Students will learn various new techniques and expand their skill levels.